1,132 sq. ft. of medical office space available for lease. Built out medical suite situated in the Bishop Street Medical Campus. The suite includes waiting room & reception, two exam rooms, two private offices, & kitchenette/record storage. Ample shared parking. $2.36/sq. ft., NNN. Available June 2019. 12,278 sq. 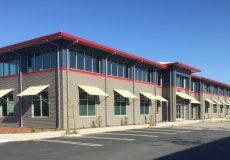 ft. of high clearance warehouse & office (+/- 8,916 sq.ft. of warehouse/ storage, +/- 3,362 sq.ft. of office). Convenient US 101 freeway access and close to downtown San Luis, warehouse has roll-up doors on both sides of the building. 7 offices, plus showroom area and break room. Secure Off-Street Parking Lot. Lease Rate: $1.15/sq. ft., NNN. Available September 2019. 27,228 sq. ft. of warehouse/office space for lease. 22,630 sq.ft. of the property is warehouse & 4,598 sq.ft. is office space. The office space consists of 11 private offices, conference room, open work areas, kitchen, & break room. Warehouse space is fitted with 2,000 amps of 277/480 volt service. Warehouse space also includes two recessed loading docks and one ground level roll-up door. $1.03/sq. ft., NNN, very low NNN costs. 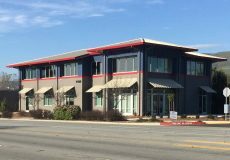 Excellent location offering a classic downtown San Luis Obispo office. Open office with lots of natural light and excellent views. Small conference room, three private offices, coffee bar area and corner open space plan. The 2,618 sq. ft. of unit includes 654 sq. ft. of shared common area. 1,642 sq. ft. of highly visible showroom/commercial space. Excellent Betteravia frontage and location. Subject property has excellent street visibility and is zoned to allow multiple uses (Zoning: CM). Ample shared parking. Immediately available with recent price per square foot reduction. Three suites still available in cannabis appropriate warehouse building. Suite A1 & A2 are both 1,500 sq. ft. respectively & currently configured as office; can be converted to warehouse. Suite B1 is 1,500 sq. ft., configured as open warehouse. Total property is +/- 1.86 acres. Easily accessible site, fitted with well and septic Zoning: Industrial (County of San Luis Obispo), 400 amp, 3 phase power, 192 kW. 4460-4484 Broad St. is an approved office/retail development with excellent street exposure. Building A (4460 Broad St) has the building shell completed and is available for TI’s now. Second floor available for lease: 3,697 sq. ft. Suite sizes can be 1,000 sq. ft. $2.25/sq. ft., NNN with $50/sq. ft. Tenant Allowance. Additional buildings are still available. 4460-4484 Broad St. is an approved office/retail development with excellent street exposure. Building D (4476 Broad St) has the building shell completed and is available for TI’s now. Suite sizes can be 1,000 sq. ft. $2.25/sq. ft., NNN with $50/sq. ft. Tenant Allowance. Additional buildings are still available. 4460-4484 Broad St. is an approved office/retail development with excellent street exposure. Building E (4480 Broad St) has plans are City- Approved and construction will begin shortly. Total Building size 6,830 sq. ft. on two floors. Suite sizes can be 1,000 sq. ft. $2.25/sq. ft., NNN with $50/sq. ft. Tenant Allowance. Additional buildings are still available. +/- 2,630 sq. ft. Medical Office sublease. Well located in the heart of the Sierra Vista Hospital’s medical district, a free standing medical office building as part of a medical cluster of buildings. Very recently remodeled with great natural light. This is offered as a sublease which had an original three year term. There is an opportunity to write a longer term lease.